The Honey thyme Vinaigrette is very complimentary to this salad. I love the diversity of flavors with the honey, lime juice, vinegar and thyme all mixed together with the fruit. The thyme gives an extra cool factor punch. For the very best flavor, be sure to serve this Fruit Salad with cold vinaigrette. Pomegranate seeds bring some crunch to this salad, while the pulpy sweetness of grapes is balanced by tangy and sweet taste of orange, pineapple -Tossed with a sweet, slightly tangy and herby lime-Thyme Vinaigrette, this salad showcases the best flavors and colors that winter has to offer and gives summer salads a run for their money. Place all the ingredients mentioned in a blender and blitz to combine. Pour into a container with lid and refrigerate for 1-2hours, until flavors have blended. 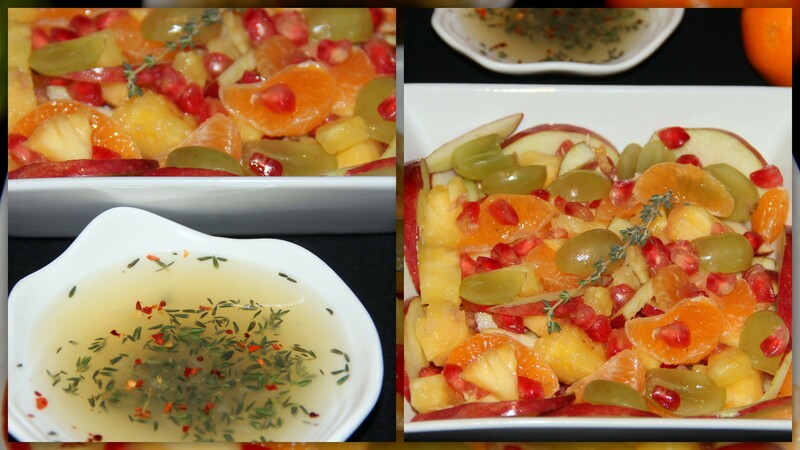 In a large bowl, gently toss together the pineapple, apple, grapes, orange, pomegranate with dressing until combined. Garnish with fresh thyme and serve. The any combination of fruits can be used as a variation. This dressing can also be used with greens, veggies and salads. Posted on January 6, 2015, in International, Salad/Wraps, Soups, Salad and Wraps. Bookmark the permalink. 26 Comments. I think your choice of fruit is perfect with the vinaigrette. In the spring/summer a salad with strawberries and this dressing would be lovely too!! So pretty! Can’t wait to try this. Basil works great too with fruits. Hummm… that sounds different, interesting — and yummy!